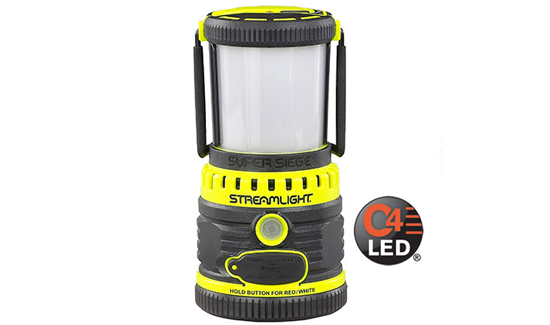 The high-performance lighting experts at Streamlight® Inc. are beaming about their new Super Siege® LED lantern, a brilliant 1,100 lumen rechargeable light that’s one of the brightest on the market. Ideal for large-scale scene lighting needed by first-responders, the Super Siege also functions as an auxiliary USB power source to charge personal electronic devices. Its rechargeable 8800 mAh Lithium Ion battery provides up to 4 full charges for most smartphones and up to 8 full charges for most Streamlight USB-rechargeable flashlights. The new lantern features one white and four red C4® LEDs to provide six output modes. With its outer globe cover in place, the light functions as a work light for performing jobs at arm’s length; a removable Glare GuardTM can be snapped over part of the globe, enabling users to comfortably illuminate work areas while reducing glare back into their eyes. Without the Glare Guard, the Super Siege is transformed into a scene light, providing 360o of bright light to illuminate large areas. The light can be hung upside down from its top or bottom D ring. It will also float when fully assembled, and includes a hidden watertight storage compartment.